A graphene hydraulic 'nano-press' has proved to be capable of creating new two-dimensional materials by exerting huge pressure on compounds sealed between layers of graphene. Graphene, the world's first two-dimensional material, has a new property to add to its superlative repertoire. New research has shown that sealing molecules between two atomically thin sheets of graphene creates extreme pressure upon the molecules to modify their state, converting them to new crystals. The University of Manchester research group, led by Professor Rahul Nair, published the findings in Nature Communications. The striking results demonstrate new methods of creating versatile 2D materials which have unique properties and benefits for a wide range of applications. The graphene nano-press is made possible due to the material's unique properties. Graphene is stronger than diamond, which allows the extreme amount of pressure to be exerted on trapped molecules without breaking the graphene layers. The two stacked layers also create a self-sealing envelope around the trapped molecules to contain them. Molecules enclosed between two layers of graphene experience pressures equivalent of 10,000 times the air pressure in a bicycle tyre. Professor Nair said: "Due to this extreme high pressure and large confinement of trapped molecules, these graphene enclosures effectively act as a nano scale pressure cooker which works at room temperature." 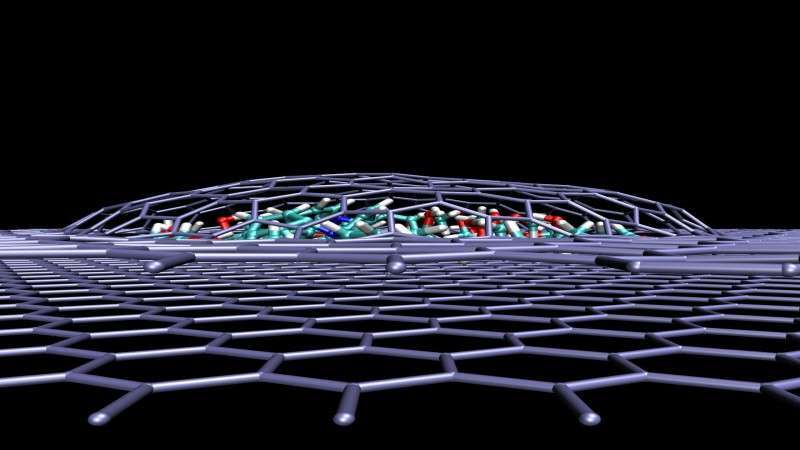 Graphene, first isolated and studied at The University of Manchester in 2004, demonstrated that two-dimensional materials have extraordinary properties which could change how we manufacture electronics, composites, batteries and more. A whole family of 2D crystals have since been discovered, increasing our knowledge and understanding of atomically-thin materials beyond graphene. These new nano-crystals allow us to expand the toolkit with which researchers can work to create the devices and applications of the future. This research was stimulated by previous work at the National Graphene Institute observing what happens to water molecules at the nanoscale. 2D crystals of copper oxide, magnesium oxide and calcium oxide were produced using this new approach at room temperature which was previously thought to be impossible. Conversion of salt solutions such as copper sulphate, or magnesium chloride usually requires exposure to intense heat and pressure to create these reactions. This new method incurs the same results at room temperature via the pressure created in a one nanometre enclosure between two graphene layers. Dr Vasu Siddeswara Kalangi, the first author on the research paper said: "The observed effects are not limited to graphene enclosures; other 2D crystals can be used, too. Our study shows the possibility of exploring high pressure chemistry and physics at the nanoscale using the graphene hydraulic press." Current research within the 2D materials field focuses on fabricating heterostructures made by layering different atomically thin materials and studying various heterostructure devices, for example, nano-sized LEDs. This new research also allows scientists to understand the effect of trapped molecules within new heterostructure devices which could help or disrupt their work. Exciting new avenues have opened up to allow for a better understanding of the world around us on an atomic scale and accelerating the commercialisation of new graphene-based devices. ouldn't you just say 1.4 gigapascals and be done with it? But only in a small area. With this you can basically have that pressure over an as wide area as you want. Diamond anvils aren't really useful for actually producing significant amount of material for industrial applications. This approach might. I wonder if they could maintain a metallic hydrogen state with this. The Wikipedia article says "hundreds of GPa," so it's a couple orders of magnitude over what's reported above, but it sounds like they're just getting started so we'll have to see. The authors of this item made me question their intelligence with "creating versatile 2D materials ... by exerting huge pressure on compounds sealed between layers of graphene." But they totally lost my attention when they indicated "pressures equivalent of 10,000 times the air pressure in a bicycle tyre." It's bad enough to be subjected to this kind of BS on the evening news, but it is totally unacceptable on a Science website. It's a popular science website, which means that you can expect to see things being put in a manner that is accessible to the general public. Get over it. So, because it's a popular science website it should be OK to have vague, misleading and inaccurate BS foisted on us? Science has a bad enough reputation because of BS in the media masquerading as research. But they totally lost my attention when they indicated "pressures equivalent of 10,000 times the air pressure in a bicycle tyre." So IOW you reject the science because you don't like the words used to describe it to you? Is that what you're saying?? Are you defending nonstandard and meaningless descriptions that can not be converted into standard units without guessing at what pressure the authors inflate their bicycle tyres? Reject the science? The article does not presents science. I reject the article. Nothing new, as are many of these 'new' properties of graphene. Millie Dresselhaus at MIT was reporting on the properties of graphene in the 1980's (and maybe 1970's). The only breakthrough in 2004 was scotch tape. If the author/editor want to report on the real story of graphene, they should take a look at her work. It is long past time to set the record straight.